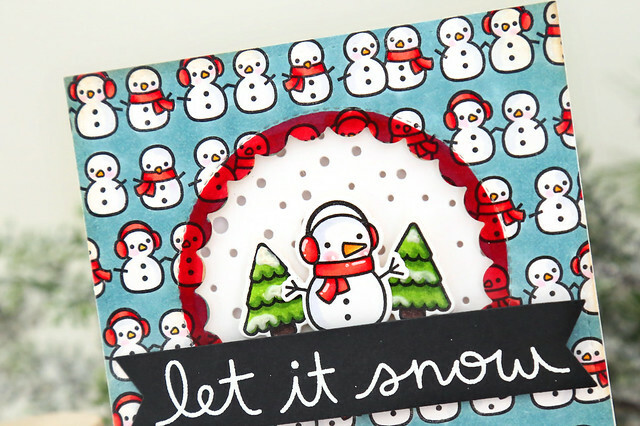 I stamped the strip of snowmen over and over again to create the card's background. I staggered the stamp every time, so that it looked more like a patterned paper. I then colored the snowmen accessories in a Christmas red, and colored the entire card base with a dusty blue marker (copic marker BG70.) It gives a kind of retro look with the red, I think! And just to give the focal image a little more pop, I used a red marker to color in the scallops in that circle window. 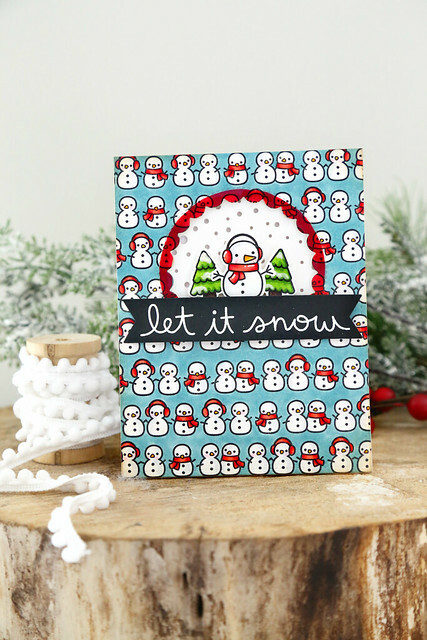 A white-heat-embossed sentiment, from Winter Scripty Sentiment, sealed the deal. I hope you like it! Check out the LF blog this morning for more inspiration using this set: click! I love how you used the same over and over to make background paper. This is just so freaking adorable!! I just love it! !